This three-day, 54-hole event will once again take place on the Schoolmaster Course of the Robert Trent Jones Golf Trail at the Shoals in Muscle Shoals, Alabama. This is the second consecutive year this event will be contested on the 6,043-yard, par-72 Schoolmaster Course, and the fourth time the women’s championship has been played at the RTJ stop at the Shoals. The Govs will be joined by two-time defending champion Murray State, Belmont, Eastern Illinois, Eastern Kentucky, Jacksonville State, Morehead State, Tennessee State and Tennessee Tech in this event; Austin Peay is scheduled to begin play at 8:50am, Monday, paired with Morehead State and Belmont. An incredible amount of experience comes into this event for Austin Peay, and they’ll need all of it as they look to bring home the program’s first top-three finish since 2002-03. For the fourth straight year, both Taylor Goodley and Ashton Goodley will be in the lineup, while both junior Meghann Stamps and senior Reagan Greene look to reprise their roles in the top-10 from last season. But with all that experience, a fresh-faced newcomer will lead the way at the top of the lineup. Taylor Dedmen, whose spring session alone would merit consideration for OVC Freshman of the Year honors, will slot in as the No. 1 and as Austin Peay’s leader in stroke average (76.0); she’ll look for Austin Peay’s first top-10 finish by a freshman since Jessica Cathey (t-ninth) in 2013. Stamps and Greene will play as the No. 2 and No. 3 players in the lineup this week, each with a top-10 to their credit this season; Stamps was eighth in her last appearance in Alabama, at September’s Chris Banister Classic in Glencoe, while Greene closed the fall with a win at the Town and Country Invitational in Nashville, TN. While Stamps had been taking a round to really warm up—even after a 76-76-77 at Murray State two weeks ago, she’s still averaging a full stroke more in her opening round than in later rounds—her progress at the Jan Weaver Invitational indicates a determination to get out to a solid start this week. Twin sisters Taylor Goodley and Ashton Goodley will each compete in their fourth OVC Championship event. Taylor looks to add to a career that has already produced an All-OVC accolade as a sophomore and an All-Newcomer slot as a freshman, while Ashton looks to recapture the magic that helped her gain All-OVC honors last season. Live scoring will be available at OVCSports.com’s Tournament Central page, with the top-five finishers slated to earn all-tournament honors. 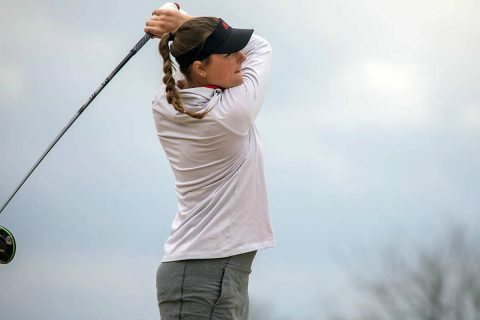 LetsGoPeay.com will have a complete recap each day, while Austin Peay’s women’s golf twitter (@AustinPeayWGO) will have updates throughout the round. The OVC’s postseason awards banquet will be held Monday night; LetsGoPeay.com will recap the season of any Austin Peay honorees that evening.